Another proposed line that is edging towards realization is Tram Affoltern. The information I provided on this has been somewhat sparse recently but the present status is that planning began in March. An opening is envisioned for 2027. 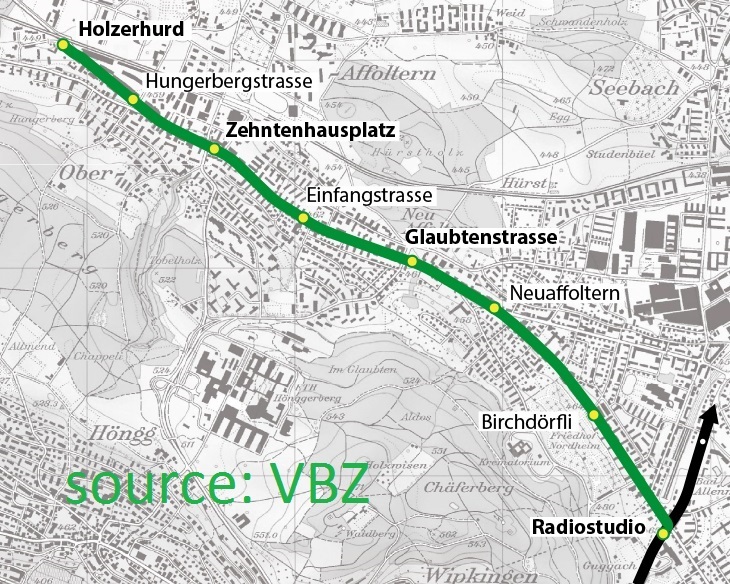 The new tram line between Radiostudio and Holzerhurd will replace a section of trolleybus 32. With the population of Affoltern growing and further new areas being developed, the existing link is approaching its capacity limit. Furthermore, a tram would provide a direct link to Zürich's city centre. The line has been in discussion for some time. In the network development strategy presented in 2006, the line was part of the long term planning (beyond 2025). By 2012, the project was clearly gaining political momentum and an opening by 2022 was envisioned. But things got a bit quieter after that with activity now finally resurging. The line will be served by tram route 11, with the 11's present service to Auzelg being taken over by route 15.